Sidechained compression is an ubiquitous sound in dance music. Its pumping sound brings a shot of energy to basslines, pads, lead synths, vocals: nearly any element of an EDM track. To help a sidechained sound gel with the rest of your production, synchronize the compressor’s timing parameters to the track’s tempo. Syncing the compressor’s attack and release controls to the BPM tells it to pulse in time with the beat, making it sound much better, rhythmically speaking. Few if any compressor plugins have beat-sync abilities built in, so you’ll need to either use a delay calculator like the one in our Producer Tools mobile app to find the correct times, or work out the synchronization manually. 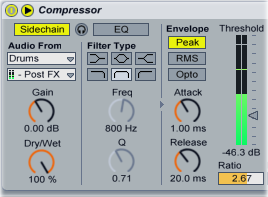 Load a compressor plugin onto the synth, vocal, or pad that you want to sidechain to the kick. Set the compressor’s sidechain input to the kick drum channel, then turn the threshold down and the ratio up until you hear the synth’s volume start to pump. Now we’ll need to figure out the attack and release times that correspond to the beat. If you have Producer Tools or another delay calculator, this part is easy: just launch the Delay Calculator function, type in the BPM of your track, select a note length and hit “Calculate.” If not, you can still figure out the times by hand: just divide 60,000 by the BPM of your track to find the number of milliseconds in a quarter note, then divide that in half to find an eighth note’s length, and so on. This track is at the very common house tempo of 125 BPM. We want the sidechained synth to pump pretty hard and fast, so let’s sync the compressor’s attack and release to short note values. A thirty-second note at 125 BPM is 60 milliseconds long, so let’s set the release control to “60 ms.” We’ll want the attack to be even shorter, so let’s sync it to a 128th note, which comes in at 15 ms (if you want an even faster attack, just divide the time in half again to get 7.5 ms). Adjust the threshold and ratio controls as needed to smooth out the compression. Attack at 15ms, release at 60ms, 125 bpm.